Novemer 2011 - After seeing the nest litter spilling out last season, we decided to cut the 20 foot pole and clean out the nest box. Good thing too... because there was no room for owls in there! The litter was up to the door! We added an extra ledge on the front to help the baby owls get down off the top of the box (remember the baby that got stranded last year?) It went back up with straps around the base. Good as new and just a little lower. The female started staying in the box in early March, but the weather was blustery and it wasn't until June that she started roosting in the palm again. That's a long time to sit on eggs and feed babies, and we wondered if it's a new pair of owls this time. 06/27/2012 - Noises could be heard and the babies were peeking out in the morning. Lots of scuffling around and wings flapping in there the next day... they're almost ready to fly. 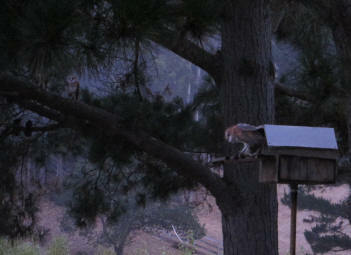 07/05/2012 - Owlet #1 came out of the nest box at dusk and flew to the pine tree right away. #2 followed shortly thereafter. 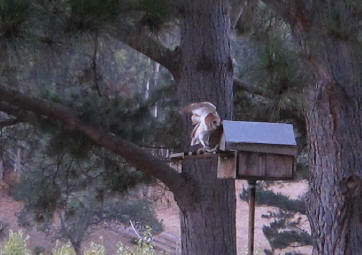 Owlet #3 appeared, all fuzzy with white down, looking nervous that its siblings had gone. Screeching back and forth at each other, they sounded like they were encouraging it. We hoped it would wait, because it didn't look ready. It flapped it's wings over and over, getting up its nerve. Could there only be three this year instead of the usual five? 07/06/2012 - Owlets #1 & #2 flew again to the pine tree at sunset. leaving #3 to watch them practice flying from branch to branch, all three screeching at each other. #2 can barely be seen flapping its wings so fast on top of the nest box (below left), as #3 waits, his fuzz flying in the breeze. 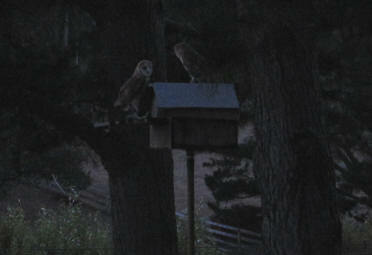 A hoot of a horned owl (barn owl predator) was heard nearby. The parents appeared in the sky suddenly, crying the alarm call, circling the neighbors pine trees (where the horned owl was). The babies were silent long after the alarm stopped. 07/07/2012 - The owlets watch as their parent flew out of the palm tree, screeching to be fed. The first two leave the ledge quickly. 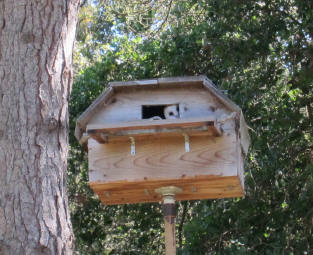 Owlet #3 is still really fuzzy and young looking, but it made it to the top of the box, and back down again OK. It is busy practicing with lots of wing flapping while screeching for food. No other screeches from the nest box... Looks like we only have a total of three babies this season. 07/08/2012 - Blue Jays squawking attracted our attention to an owlet in the pine tree before dusk. Looks like owlet #1 roosted in the trees during the day for the first time. When it got a little darker, an owlet started screeching from inside the nest box.When owlet #1 heard that, it hopped branch to branch and dropped down (flapping the whole way) onto the nest box, and went in to say hi. 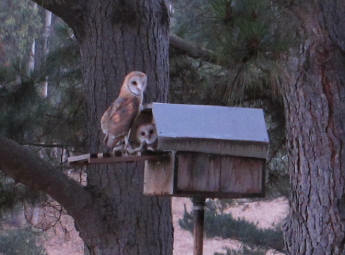 Shortly after,owlet #2 came crashing into the pine tree from nearby (two roosted outside the box!). It landed with wings sprawled out, hanging on a clump of needles for a minute, before grabbing a branch to sit on. Owlet #3 finally flew from the nest box today! It landed on the pine branch on it's first try! Hopefully it can make it back. 07/09/2012 - Owlet #1 roosted outside in the pine tree today. I woke it up when taking this picture (note standing on one leg). The local crows and blue jays left it alone until right before dusk, when the jays usually squawk and pester the owls for a few minutes before they go to sleep. Around sunset, #2 emerged from the nest box and stretched it wings. Looking around, it bobs it's head around so much that it almost falls off the perch... too funny! Last but not least, #3 comes out screeching the loudest as usual. Owlet #1 stays calm and collected on the tree branch until it's siblings fly to the trees. Then #1 joins the others jumping/flapping from limb to limb. They continue to be pretty clumsy on take offs and landings. Their screeches changed to a quiet twittering to each other... haven't heard that before, it was almost musical. Meanwhile one parent flew out of the palm tree, past the youngsters, out to hunt. 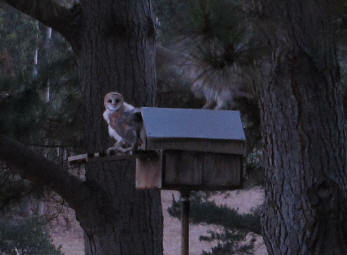 Then the other parent flew into the nest box and didn't come out for a few minutes before soaring down the canyon. That was unusual... maybe Mom was taking roll or doing an inspection or something. 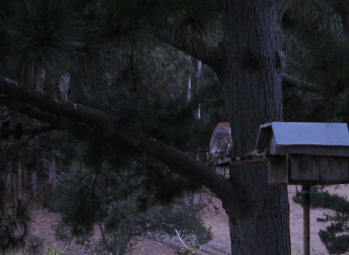 07/10/2012 - All three babies came out of the nest box after sunset. 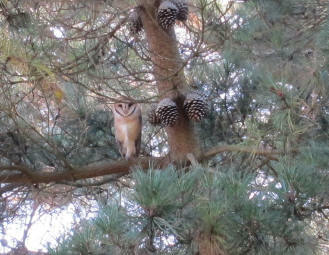 #1 and #2 stretched, and bobbed their heads as they took in the scene before flying to the pine tree. #3 came out and hesitated briefly before following them. More flapping from limb to limb, practicing landings... #3 is still very awkward and wary. One owlet took off and flew around the yard, landing back in the pine tree. Then again, flying to the palm tree... clinging on before flapping and landing, sprawled in the the cypress right overhead. 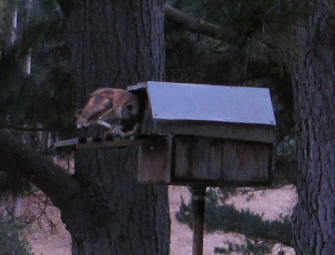 07/11/2012 - Another day with all three owlets in the next box. #1 flew to the pine tree right away and can barely be seen behind the trunk in the photo at right. #2 then flew to the low branch on the tree, leaving #3, who still looks a little fuzzy. The flew around the yard, venturing out further and further each time. #3 could be heard screeching by itself at 5am. It was joined by its siblings, the screeches dying down before they all piled back in the nest box. 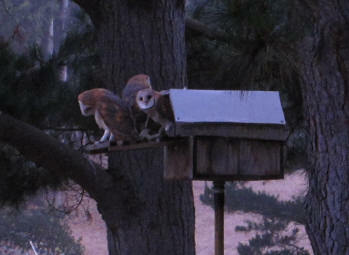 07/12/2012 - All three owlets waited on the perch at dusk for the evening festivities to begin. When the parents soar by, their screeches get louder. Soon they will follow them and start learning how to hunt rodents. 07/15/2012 - Two owlets roosted in the palm tree, one in the nest box. 07/16/2012 - All three young ones back in the nest box. Their parents roosted elsewhere, flying through after dark. 07/17/2012 - Again all three owlets roosted in the nest box. They must have no trouble getting back there and feel safe during the day all snuggled up together. 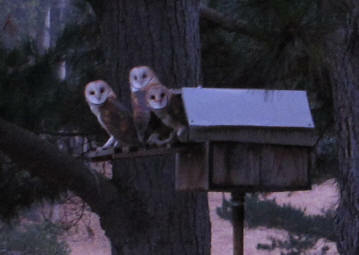 07/18/2012 - All three emerged from the nest box again after dusk. After a few minutes going from branch to branch, they practicing flying around and around the front yard to the neighbors trees and back. 07/19/2012 - All three roosted in the palm trees during the day. The screeching started early and getting out of the tree was a little tricky. 07/20/2012 - Two babies came out of the nest box and one from the palm tree. They can be seen flying back and forth, up and down the canyon during the first hour or two of darkness... and can be heard screeching all night long. 07/23/2012 - All three owlets emerged from the nestbox. 07/25/2012 - At 8am a baby could be heard screeching from the palm tree. It probably roosted next to its parent, and is complaining that it didn't get enough to eat. It started up again before dusk, until the parent couldn't stand it any longer and flew away to hunt. Two babies in the palm, one in the nest box. 07/26/2012 - All three young ones came out of the nest box again. 07/27/2012 - All the babies were roosting in the palm trees - getting out of the fronds is still hard for them. Once one is brave enough, the others soon follow. 07/29/2012 - A baby owl started screeching for food in the palm tree early. The screeches got louder and louder, almost constant, and panicky sounding. 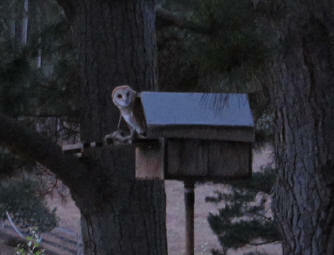 It was hard to listen to from the porch, and can imagine how fun it was for the parent owl, right next to it. Maybe the parents are not finding enough food for the whole family... or maybe going hungry is an incentive to try hunting on their own. The parent finally flew out at dusk, and the baby flew to the pine tree (still screeching). 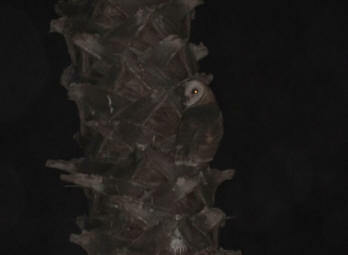 The other two owlets flew down from the other palm tree to join their sibling. They practiced flying around the neighborhood until it was too dark to see them any longer. 08/02/2012 - No screeches to be heard from the nest box or palm trees tonight before sunset. An adult flew from the palm tree. Shortly after, a screech could be heard across the canyon. 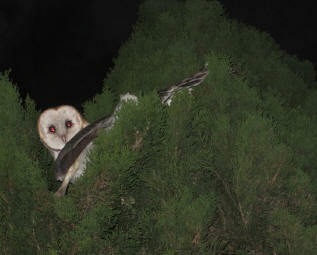 Closer it came, screech after screech, until we spotted a young owl heading for our trees. It landed, announcing that it was hungry and ready for vermin. Another owlet joined from neighboring trees. We heard the racket as they were feed about 30 mins later. 08/03/2012 - Only one flying owl to be seen at dusk tonight. No young owl screeches for food could be heard. Did everyone eat really good last night, or are they roosting/hunting elsewhere?